Getting started: The yellow chevron. This is part of the Readiness. We decide on 3 projects, pick executive sponsors, process owners, project leads, and internal facilitators for each team. Often the organization selects a BPM Program Manager as well who manages the training process for the team. The Program Manager and Process owner for each team begin to select team members according to the team roles on the charter. I am the outside consultant. I do a charter for each team (It only takes 90 minutes.) with the process owner (PO), project lead (PL), and internal facilitator. It includes purpose, current challenges, high level map, improvement targets, scope, vision, team members, and responsibilities. It is documented and reviewed by the Process Owner, Project Lead, and Facilitator. This is a critical document, and the PL revises it and maintains it as the process moves along. 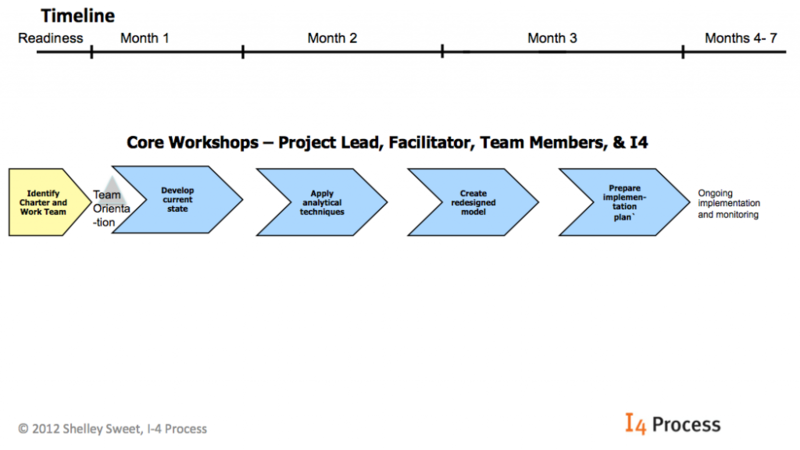 Then comes an Orientation (gray triangle in the graphic) completed by the Project Lead and Facilitator for their own team, so they know why they are doing this project, the road map and schedule, why they were selected, what they bring to the table and what their role is. Then there are 4 core workshops. Three separate teams come to the same workshop with their Project Lead and Facilitator. At the workshop they learn skills and techniques and apply them to their process improvement project. In each workshop I model these different techniques and teams apply them in the workshop to their own process under the direction of the internal facilitator. In Core Workshop 1 for example, each team builds an instance of their current state map in a swim lane format. In Core Workshop 2 they identify the i4Process pain points on the current state map. And so forth. When the teams are applying the techniques with their facilitator, I move around the room and coach each team. You can see from the timeline that the process takes about 3 months for the Core Workshops, and additional time is needed for Readiness. Implementation and monitoring occur after the Core Workshops. Readiness is critical. It can take 2 weeks to 2 months depending on how ‘ready’ the executives are and how fast the schedule can be established. The Core Workshops can be done in less than 3 months. In fact I have done them in 6 days to 6 weeks, but I suggest that you have some time between the workshops for data gathering, customer interviews, and just soak time. Want to learn more? Sign up for my live-online BPMessentials workshop, Starting and Organizing a BPM Project (June 18 and19, 2013) and Analyzing and Optimizing BPM Processes (July 30 and 31, 2013) Find out how to build high level maps with process owners and project leads, how to write a charter in 90 minutes, how to get the right members for a BPM team, how to document process models in the BPMN standard, using the free ITP software, how to use the 4 required techniques to analyze processes, and creative ways to build optimized processesPart 3 of this blog will cover the leadership sessions and team meetings of this BPM Action Learning Method.